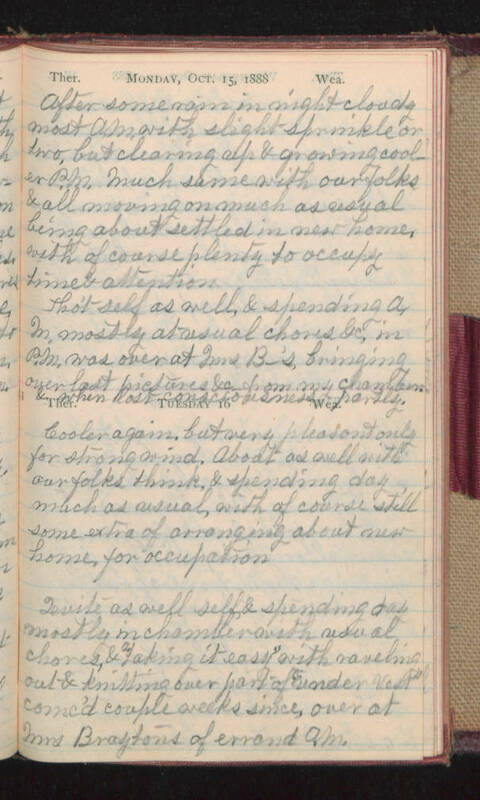 Monday, Oct. 15, 1888 After some rain in night & cloudy most A.M. with slight sprinkle or two, but clearing up & growing cooler P.M. Much same with our folks & all moving on much as usual being about settled in new home, with of course plenty to occupy time & attention. Tho't self as well, & spending A.M. mostly at usual chores &c, in P.M. was over at Mrs B-'s bringing over last pictures &c from my chamber & when lost consciousness partly. Tuesday 16 Cooler again, but very pleasant only for strong wind. About as well with our folks think, & spending day much as usual, with of course still some extra of arranging about new home for occupation. Quite as well self, & spending day mostly in chamber with usual chores, & "taking it easy" with raveling out & knitting over part of "under vest" comc'd couple weeks since, over at Mrs Braytons of errand A.M.